Are you living your life on autopilot never pausing to consider who’s in charge of your thoughts? Do you sometimes wonder why you react the way you do to things that happen around or to you? Well the good news is that it’s not you… it’s just your brain! Or more specifically, it’s the thinking errors that your brain has hardwired over the course of your life. And the even better news? You can change the way you think and react to things by simply identifying when a thinking error occurs and training yourself to correct it so you are more resilient, less stressed and a much happier person. Your brain is a wondrous miracle of nature that is responsible for every function required to keep you alive. With so much to do, your brain (like most of us) will do whatever it can to free up it’s resources for more energy intensive functions. And the most effective way to do this is by ‘hardwiring’ everything (repetitive) it can. For example: Do you remember what it was like the first time you drove a car? How much of your conscious thought was needed to keep yourself on the road? Almost all of it! Now think about the last time you drove your car. How much conscious thought was required to drive you from point A to point B now that you’ve been driving for years? Barely any. This is because over time, your brain has identified driving as a skill that’s repeated often, which means it needs to be hardwired. So you can see how hardwiring is incredibly useful for not only helping us build competency, but also in preserving our brain resources, allowing us to utilise them for other things. Why are they so important to catch? Our thoughts are the precursors to our feelings. And our feelings are the precursors to the actions we take in response to those things that happen around us. When we experience life on autopilot and let the thinking errors take control, we tend to react instead of respond mindfully which can lead to higher levels of stress, anxiety and depression. 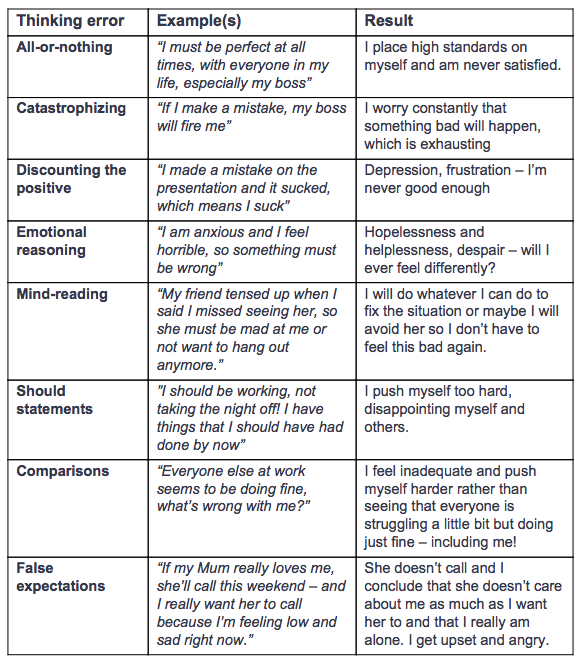 By simply understanding what these thinking errors are and identifying when they occur we can take back control. The general principal here is as you correct these thinking errors you improve your brain function and replace automatic correct assessments with what previously were false statements you were making to yourself repeatedly. And the 4 steps as featured in ‘You Are Not Your Brain’ is a key part of how you do this. They are: Relabel, Reframe, Refocus, Revalue. These are all ways that were developed to get people to bring mindfulness into their moment by moment living experience. To bring consulting your ‘Wise Advocate’* into how you regularly approach solving your problems and dealing with the thinking errors which inevitably occur. When you relabel, you call things what they really are. When you reframe you cognitively correct the thinking errors covered in the video above. And the combination of labelling things so that you become aware of what the problems really are and then reframing so that you clarify what the truth is, leads us to refocus. You do this by consulting your Wise Advocate and focus your attention on adaptive behavioural responses and that leads to focusing attention on adaptive ways of thinking. When you put the 3 steps into practice you will automatically start to change the way you value thoughts and urges and not take them at face value. You’ll recognise these thinking errors as simply sensations. You won’t take them literally – you’ll be correcting the cognitive distortions as they arise. This masterclass is now an online course. Learn more here. Join us for this special online masterclass where you’ll master the revolutionary 4 step solution from Dr Schwartz’s international best-seller, ‘You Are Not Your Brain’ and discover how to take control of your brain AND your life! What deceptive brain messages are, how to identify them as they occur and tips for handling them effectively. How you can manage negative self talk by using attention, focus and mindfulness to think more positively and intentionally. Free Will vs. Free Won’t and how to exercise your veto power! What the 4 steps are and how you can start using them in your everyday life to change bad habits and put an end to unhealthy thinking.